Soak the basmati rice in water for 10 minutes and drain the water completely. Heat 1 tbsp of ghee in a pan and fry the rice till it releases a nice aroma. Remove and keep aside. Now heat oil and the remaining ghee in the pan and add bay leaf, cinnamon, cloves, cardamom and cumin seeds. Add the green chillies, onions and ginger-garlic paste and fry everything for 5 minutes until the everything becomes tender. Now add this mixture along with salt, green peas, fried rice, coconut milk and water in a rice cooker. Once the rice is done, garnish with cilantro. Serve with spicy chicken curry. 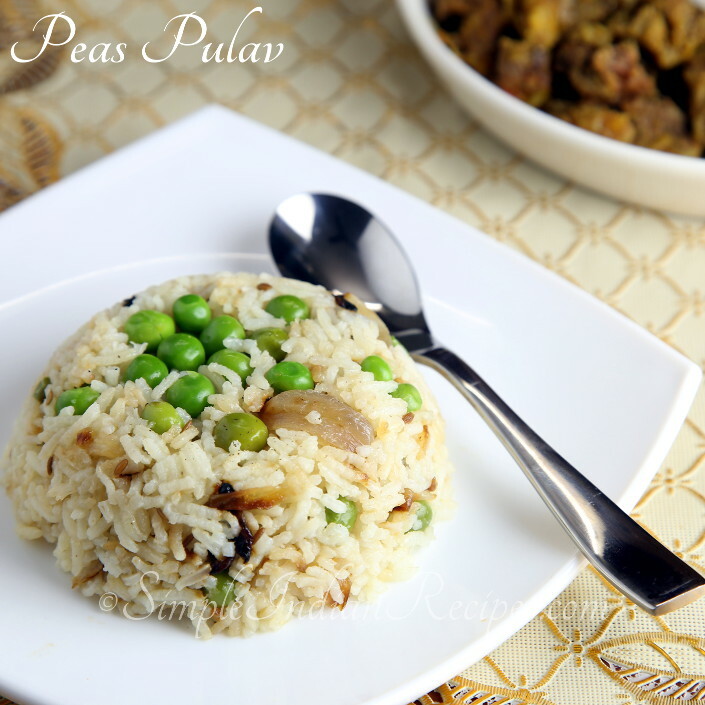 Serve the peas pulav with any Vegetarian Gravy or Non-Vegetarian Gravy. TThos rice is very spicy and yummmmmmmmy! Oh. you can scale down the spice level if you prefer. This is very nice website for indianrecipes iam very thankfull for your site please add me in your mailing list and mail some varity tiffin recpies. Sure. I'll invite you to join the mailing list. Here are some tiffin varieties. Hi! i am really learning and trying on ur reciepies and my family is enjoying it. plz add me to ur mailing list. Thanks for trying the recipes. I'm glad your family is enjoying. I'll send you the invitation to join my mailing list. Sure. I'll send you the invitation to join my mailing list. I usally wash and soak the rice for about 10 minutes. Then add water in the ratio 1:1.5 i.e 1.5 cups of water for 1 cup of rice and cook it on stove top or rice cooker. 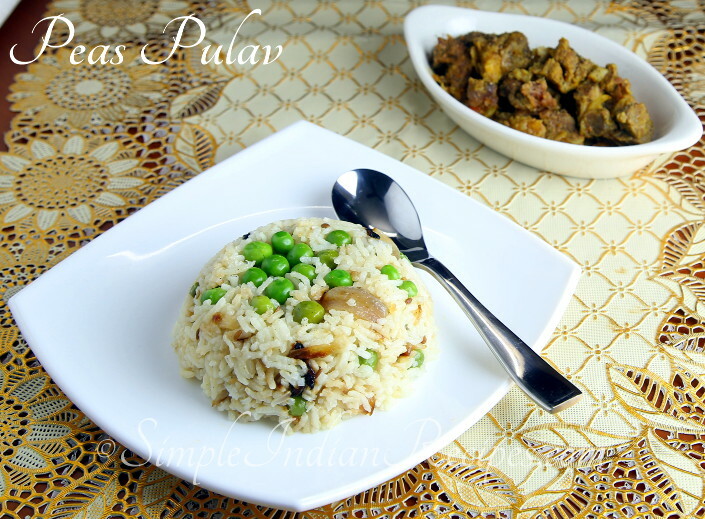 When making pulao or biriyani, you can also fry the rice in some ghee or oil before cooking. This will ensure that the grains of rice are seperate. It tastes best with basmati rice. Hi Gunjan. Its not compulsory to soak the rice. But soaking improves the texture of the final pulao. hi, can coconut milk be optional?if yes what is the substitute of that? Yes. Coconut milk can be skipped. In that case use only water to cook the rice. Use 1 1/2 cups water for 1 cup of rice. what would be apt veggie side dish for this? no non veg. This goes well with any sidedishes. I usually make it with gobhi manchurian. Hi dahlia, is green peas need to be soaked?? i used frozen peas. so i used it as such without soaking. but if u use dried ones, u have to soak.... fresh peas need not be soaked either. Published by Dahlia Twinkle on 2012-03-02 and last updated on 2017-09-18.